The official Emby client app for Samsung Smart TVs for both the Tizen and Orsay platforms is currently only available in the Samsung store within the US, UK and now Ireland also. However, if you live outside these areas and would like to use the official Emby app then you may be able to switch your Smart TV Hub region to US as a temporary work around until it's available where you live. Please see the warnings at the bottom of the page before following the instruction below (*). Select Menu on the remote control. Change your Samsung Smart TV region to United States of America. Continue the setup from the Samsung store as usual. Using Smart Control remote: Mute, Return, Volume Up, Channel Up, Mute. Click on the “Menu” button on your Samsung remote control. Select “Reset Smart Hub”. Enter PIN if prompted. Agree with the Samsung Terms. Choose US as your new Samsung Smart TV region. 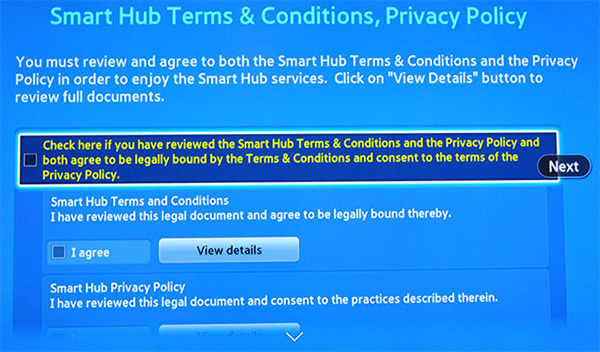 After successfully changing your TV's hub region you should be connected to the Samsung Store within the US and can then follow the installation instructions on loading the official Emby app on your Samsung Smart TV. If you get a message unable to connect to Samsung server AS415 error try changing the menu to English and give it some time to populate so you can download via search. It may not be able to find/browse for the app in the video category. Once the official Emby app is available in your region then redo the steps you followed above changing your TV's hub region back to it's original location and then reinstall Emby from the Samsung store again. You can only access Samsung apps from one region at a time. This means you cannot load the US Samsung Emby app with the UK BBC iPlayer app at the same time and your old apps will most likely be deleted. To unblock other applications such as Netflix, Amazon Prime after changing your Smart TV Hub region you may also need to change your geo-location using a VPN or Smart DNS. ​The times for LiveTV may be off depending on your location. ​Emby and the Emby community users take no responsibility if you somehow mess up your TV by attempring to use these instructions. ​If any of these warnings concern you then you may want to wait for the official Emby app to be available in the Samsung store at your location. Edited by FrostByte, 01 November 2018 - 02:51 PM.